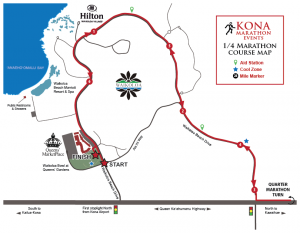 The 2019 Kona Quarter Marathon (10.55/6.55 mi.) will be located at the Waikoloa Beach Resort on the Kohala Coast. The race will start and finish at the Waikoloa Bowl at Queen’s Garden. The Kona Quarter Marathon start at 7:00 am. 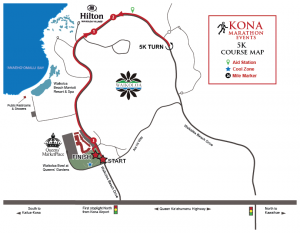 The 2019 Kona 5K will be located at the Waikoloa Beach Resort on the Kohala Coast. The race will start and finish at the Waikoloa Bowl at Queen’s Garden. The Kona 5K start at 6:45 am. Race cutoff is eight hours after the start of the Marathon. This allows enough time for any trained participant to complete the course, even if you plan to walk. After this time the course will be re-opened to traffic and aid stations will be closed after the last participant passes or at 1:30 pm. Some close as early as 11:00 am.